A collection of essays, speeches, and eyewitness accounts from those directly involved in the events of 1989 in Central Europe. 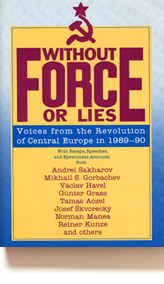 Contributors include Andrei Sakharov, Václav Havel, Alfred Herrhausen, Reiner Kunze, Edith Anderson, Eric Gabriel, Günther Grass, Ewa Kuryluk, Leszek Balcerowicz, Adam Michnik, Josef Skvorecký, Tamas Aczel, George Paul Csicsery, Norman Manea, Thomas A. Oleszczuk, John Jekabson, William M. Brinton, Z (anonymous), and Mikhail Gorbachev. William M. Brinton (1920-2010) was the founder of Mercury House. An attorney with a background in international law and litigation, he authored The Alaska Deception and A Role for the Small Press: Publishing in a Global Village. Alan Rinzler has been an editor at Simon and Schuster, MacMillan, Holt, Bantam, and Grove Press, and was one of the founding members of Rolling Stone. He lives in Berkeley, California.